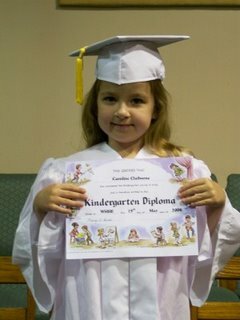 My little sweetie had Kindergarten graduation last night. She looked so cute in her cap and gown. I declare, my face about broke from smiling. Here are a few pics. The other kids are in our homeschool support group, White House Home Educators. I could NOT homeschool without this group. They are my life-line. The Moms are some of my favorite people on the Earth. They are just precious. This is seriously the nicest group of people I know. I love all of them. I worked today and we got in the re-order of Cathy Z's new book. Get it while it lasts if you're interested. OH Wow Tracy! The beginning of MANY school days ... brings back memories huh?! Wasn't so long ago we were best buddies and in our own little world! Those were the days! Love ya! How cute is your daughter? OMGosh, she is precious. 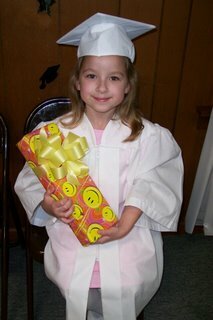 I remember graduation day for my oldest. It is such a great feeling. I love seeing them proud of themselves. The Barbie is too cute too. Hey, I asked Ann on the ScrapIt! blog, but I didn't know if she'd see it or not, but do you know if they plan on ordering any of the Li'l Davis Tinseltown line? I took the Tinseltown class at CKC and really liked the glittery stuff! How very exciting! Caroline looks so cute and grown up! 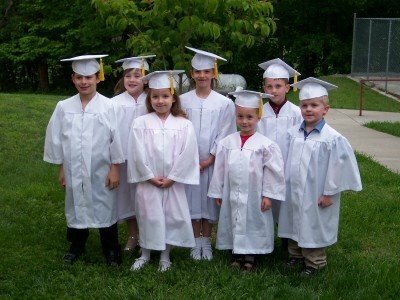 I think it is so great that you have your home school group. I don't know how anyone could do it without one! Thanks for the heads up on that book! I need to get one! The last pic of Caroline was prob my favorite of her ever. She's gorgeous! We make such pretty babies!